Anyone who’s lost weight knows that the scale in your bathroom sometimes lies. Earlier this year, I started the first genuine attempt at changing my lifestyle, improving my health and losing weight. When I began this year-long mission to adhere to the federal Dietary Guidelines and Physical Activity Guidelines, I truly didn’t know what to expect. I was testing myself in ways I never had before. The first few months of this journey certainly had its challenges, but looking back and seeing how far I’ve come has made it all worth it. I haven’t just shed a few pounds — I’ve changed the way I look and feel, and how I see myself. Just how far did I come in 90 days? Farther than I ever thought possible. My focus for this project was never really weight loss, though I was happy to see that my efforts yielded some positive results. After just three months of adhering to both sets of guidelines with the support of the American Council on Exercise, I lost 16.3 pounds (7.4 kg), going from 244.5 pounds (111 kg) to 228.2 pounds (104 kg). 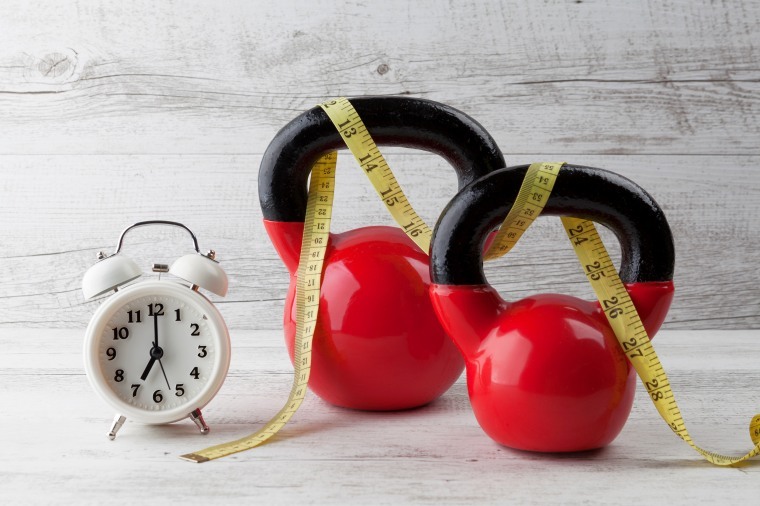 While fast ways to temporarily lose weight exist, it’s important to note that most experts agree that rapid weight lost is unsustainable and those pounds usually end up creeping back on. Instead, experts recommend the slow and steady approach of one to two pounds per week. Anyone who’s lost weight knows that the scale in your bathroom sometimes lies. It says you haven’t lost a pound, yet those pants that felt a little tight are suddenly easy to put on, and are even starting to get baggy. The change in body shape is the result of gaining muscle while losing fat — and that simply doesn’t show up on the scale, at least not right away. That’s why I also used body circumference measurements to help me track my progress. My waist circumference decreased by 5.5 cm (2.2 inches) over three months, which means my risk levels for all of the above should decrease. A person’s waist-to-hip ratio is another simple means of determining overall health risk. On day 1, my waist-to-hip ratio was 1.08, as determined by dividing my waist circumference (117 cm) by my hip circumference (108 cm). By day 90, that ratio was 1.04. The goal is to get that ratio below 0.95, as that is when I will move out of the “at risk” category. For now though, things are certainly moving in the right direction. At some point, I will likely hit a plateau in terms of reducing my waist or hip measurements, which is why including the chest, abdomen, biceps and thigh measures may become important when I need a new source of motivation. In addition to monitoring my weight and circumference measures, I’ve also been monitoring my body-fat percentage using two different methods. At the three-month mark, my skinfold measurements totaled 83 mm, equating to a body-fat percentage of 26.1%, down from 26.9% at the start of this project. The other means of tracking body-fat percentage is my FitBit scale, which shows a decrease from 33.1% to 30.7%, a sharper drop than was revealed by the skinfold measurements. Either way, a body-fat percentage over 25% for men (over 32% for women) is categorized as obese. To start this project, I completed a full performance assessment, including push-ups, curl-ups, squats and a one-mile walk test. Being that I wasn’t regularly active, my initial athletic performance wasn’t as good as I would have hoped. For the initial push-up test, I actually did pretty well. I was in able to do 21 reps, which put me in the “very good” category. At 90 days, though, I could perform 25 reps, which put me in the “excellent” category. For the body-weight squat test, I performed 64 reps, as compared to 58 reps three months earlier. Both totals are categorized as “excellent.” However, my trainer noted back on day one that I wasn’t quite reaching proper form. This time around, I moved through the full range of motion on some repetitions, but not all. While my muscular endurance is “excellent” for this movement, I need to keep working on my range of motion. It’s also important to note that during my first assessment I felt some low-back pain and this time around I had none. This is a really dramatic sign of functional improvement. The one-mile walk test involves simply walking a mile as quickly as possible — no jogging or running allowed. I have had trouble with shin splints for a long time, particularly when trying to walk quickly. I struggled a lot with this test during the preliminary phase. I actually had to quit before finishing this test the first time. On my second attempt a few days later, I still felt the shin splints, but was able to complete the test in 17 minutes and 3 seconds, which was “poor.” My heart rate was 120 beats per minute (bpm) at the conclusion of the test and my rating of perceived exertion was two out of 10, which was basically my perception of how hard I was working from a cardiovascular perspective. Unfortunately, the pain really slowed me down so I wasn’t really able to fully exert myself. I walked the mile in 16 minutes and 13 seconds 90 days later, which moved me from “poor” to “fair.” My heart rate was 132 bpm and my rating of perceived exertion was three, which is considered moderate. Tightness in the lower legs was still an issue, but not nearly as bad as it was three months earlier. While I have tons of data and measurements to show how far just three months of The Lifestyle Project took me, there are intangible improvements that are much more important. I feel better just living my daily life. I perform better whether on the hiking trails, on the elliptical machine or in the weight room. My recovery time after strenuous workouts is a fraction of what it once was. I’ve gone down a size in both my shirts and pants. My wife and son are both more active and eating better. And, perhaps most importantly, I just feel healthier and more comfortable in my own skin. While I’m charting every little measurement of my progress, you definitely don’t have to. It can be maddening when certain measurements, like body weight, don’t budge. Circumference measurements are perhaps the best way to find evidence that your body is changing, yet the biggest change you should measure is how you feel about you. Who cares if your weight hasn’t gone down if you can feel the difference in the way your clothes fit or feel stronger and more energetic during and after workouts? Are people telling you that you look better? Believe them, and take a moment to enjoy the compliment. You’ve earned it! What other signs of success have you seen as the result of lifestyle change? Tell me about it. Have questions about my journey? Ask me on Twitter or follow me on Instagram.